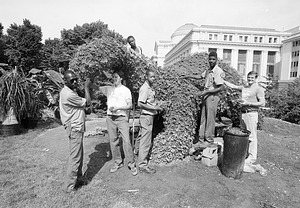 Smithsonian Gardens was established in 1972 as the Horticultural Services Division of the Office of Plant Services to provide appropriate landscaping outside of Smithsonian museums and decorative greenery inside Smithsonian buildings. Today, Smithsonian Gardens is an accredited museum that provides living classrooms and urban sanctuaries for Smithsonian visitors. 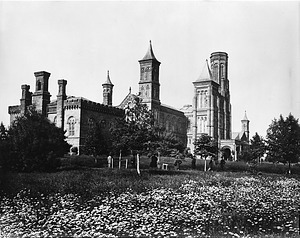 SI Building from the Northeast with Flowers Along Mall, Smithsonian Institution Archives, MAH-9748A: North facade of the Smithsonian Institution Building (SIB), also known as the "Castle," from the northeast, before the fire of 1865, showing people on a path in front of the Castle and a flower-covered expanse along the Mall in front of the building. 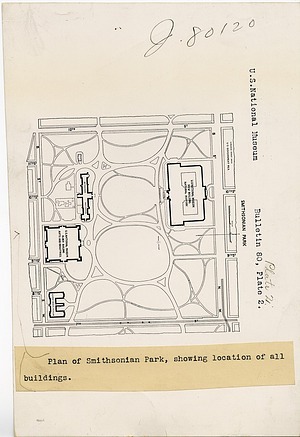 Plan of Smithsonian Park, Smithsonian Institution Archives, SIA2009-1817: Plan of Smithsonian Park, circa 1913, showing location of all buildings. Used in United States National Museum Bulletin 80, plate 2. Garden Shed in the South Yard, Smithsonian Institution Archives, 72-8167: Garden shed on the grounds around the Smithsonian Institution Building. 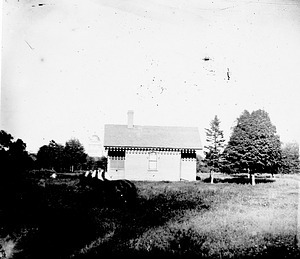 There is a man with a horse (which is quite blurry) in front of the building and the dome of the United States Capitol building can be seen in the background. The Arts and Industries Building is now on this site. 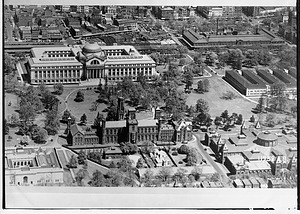 Aerial View of Smithsonian Institution Building and Natural History Building, by Army Air Corps, Smithsonian Institution Archives, 2002-10673: Aerial view from the south showing the Smithsonian Institution Building with the United States National Museum, now the National Museum of Natural History, across the Mall. South of the SIB are visible the Astrophysical Observatory sheds, the South Shed, and the elongated Air Museum in a temporary metal building. The South Yard is flanked on the left with the Freer Gallery of Art, opened to the public in 1923, and on the right with the Arts and Industries Building. On the right are temporary buildings erected during World War I and behind them is Center Market. The Mall is landscaped with winding footpaths and dense clusters of trees, reminiscent of Andrew Jackson Downing's 1851 plan for the Mall grounds. In the early 1930s the Mall was leveled and the trees cleared as part of the McMillan Commission's efforts to return Washington to the L'Enfant plan. 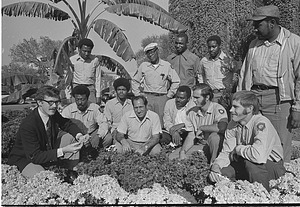 Landscaping Staff in Victorian Garden, Smithsonian Institution Archives, 73-10384-9A: Landscaping staff gathered around one of the Victorian-style flowerbeds in the South Yard of the Smithsonian Institution Building (SIB), including director of the Horticultural Services Branch, James Buckler. Office of Horticulture's Deirdre Armstrong, by Richard Strauss, Smithsonian Institution Archives, 89-9106-8: Office of Horticulture's Deirdre Armstrong has sole responsibility for the Mary Livingston Ripley Garden, located between the Arts and Industries Building (visible in the background) and the Hirshhorn Museum. 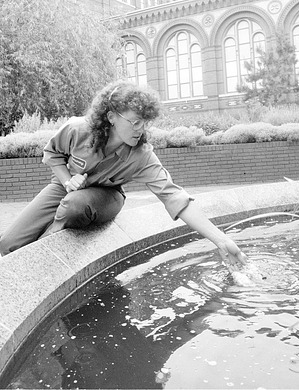 She is pictured here feeding the Japanese koi whom is eating right out of her hand. Nature’s Jewels Exhibit, 2003, by Harold Dorwin, Smithsonian Institution Archives, 2003-1817.: The outdoors came inside the Arts and Industries Building in 2003 when it hosted Nature’s Jewels: A Living Exhibit of Butterflies and Orchids prepared by the Horticultural Services Division, the US Botanic Garden, and the Insect Zoo in the National Museum of Natural History. 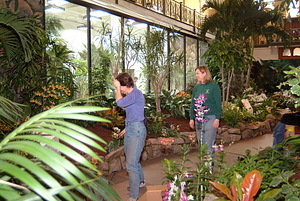 Visitors could see butterflies up close in a special enclosure and wander through a display of many varieties of orchids. 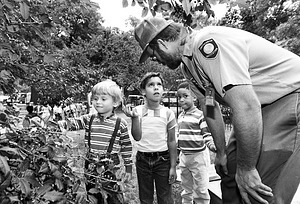 Learning about Plants with Ray Dudley, by Rick Vargas, Smithsonian Institution Archives, 89-13777-28A-29: Ray Dudley, assistant grounds foreman in the Office of Horticulture, gives some Smithsonian Early Enrichment Center pre-schoolers the word on the trees and plants in their playground. He also gave the kids some safety tips--including a warning not to eat holly berries. 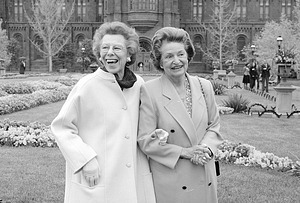 Enid A. Haupt and Lady Bird Johnson, by Richard Strauss, Smithsonian Institution Archives, 88-8669-12: Enid A. Haupt (L) and Lady Bird Johnson (R) in the Enid A. Haupt Garden in the South Yard of the Castle, on their way to a celebration being held for Mrs. Johnson in the Arts and Industries Building, April 24, 1988, in honor of her 75th birthday. Mrs. Haupt, a New York philanthropist and noted supporter of horticultural projects, donated funds to build the garden over the underground complex consisting of the National Museum of African Art, Arthur M. Sackler Gallery, and S. Dillon Ripley International Center. 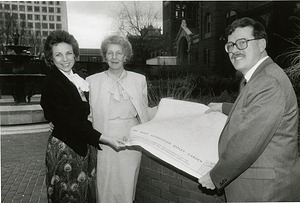 Holding Plans for the Mary Ripley Garden, by Laurie Minor-Penland, Smithsonian Institution Archives, SIA2011-1373 and 88-5566-3: The Smithsonian Women's Committee's Valerie Burden (left), Mary L. Ripley and James Buckler, horticulturalist, holding plans for the forthcoming Mary Livingston Ripley Garden, once known as the Sensory Garden or the East Garden, to be developed at the east side of the Arts and Industries Building. The garden was dedicated in the summer of 1988. Mary Ripley was the wife of Smithsonian Secretary, S. Dillon Ripley, founder of the Women's Committee, and an avid gardener. Topiary Dinosaur on National Museum of Natural History Grounds, by Dane A. Penland, Smithsonian Institution Archives, 90-7429-13: Topiary dinosaur built out of steel rods and angle iron wrapped with chicken wire, the frame was filed with sphagnum moss containing soil in which to plant the leafy dino's coat. Admiring their handiwork are, from left, Gardener Robert Burgess; Gardener/Leader Walter Howell, who designed and built the critter; Gardeners Antonie Myles (Top), Thomas Brown and Kurt Donaldson; and Modelmaker Reed Martin, who helped build the topiary, now on view at the southeast corner of the National Museum of Natural History grounds. 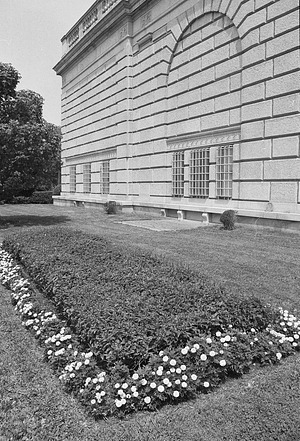 Flower Garden Beside Freer Gallery of Art, Smithsonian Institution Archives, 76-13824-10A: Flower garden plot surrounded by lawn on one side of the Freer Gallery of Art building. The east wall of the Freer Gallery of Art and a tree is visible in the background. 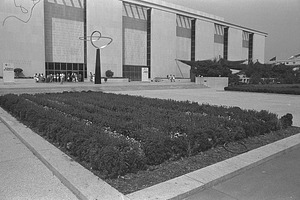 Exterior of Museum of History and Technology, by Sandy Bremer, Smithsonian Institution Archives, 76-13824-20: Mall facade of the National Museum of History and Technology, now the National Museum of American History, showing horticultural plantings in the foreground, August 12, 1976. The Infinity sculpture, installed in 1967, is visible in the background, as well as the wooden awning structures designed a few years after the building's completion to provide shade for visitors. There are signs directing visitors for "A Nation of Nations" to the side of the building. 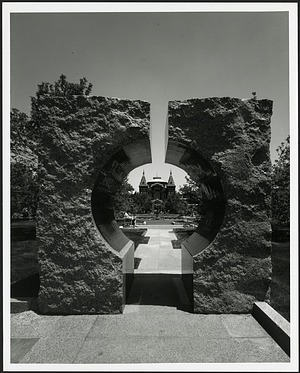 Moongate, Entryway to Sackler Garden, by Robert Lautman, Smithsonian Institution Archives, SIA2013-07637: In this image, the Arts and Industries Building can be seen in the distance from the Enid A. Haupt Garden. This view is taken through the "Moongate" next to the Arthur M. Sackler Gallery and Freer Gallery of Art, both devoted to Asian art. The "Moongate" was carved from a solid piece of granite nine feet tall.